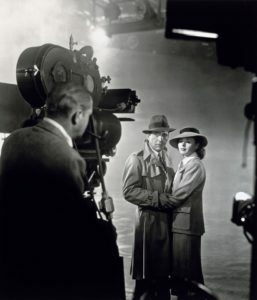 On this day, in 1942, Casablanca premiered in Hollywood. 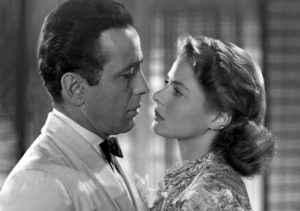 The film, starring Humphrey Bogart, in his first romantic film, and Ingrid Bergman, won an Academy Award for Best Picture. Set during World War II, The film stars Humphrey Bogart as Rick Blaine, a successful nightclub owner and American expatriate in the Moroccan town of Casablanca. Bergman’s character, Ilsa Lund, enters the bar with her husband whom she previously presumed had died attempting to escape a German concentration camp. Upon discovering he was still alive she abruptly leaves her lover, Blaine, without explanation. Blaine is heartbroken. Now reunited, Lund must ask a still bitter Blaine to help her and her husband get letters of transit to enter the United States. Casablanca became an instant classic and is considered by many to be one of the greatest films of all time.